Google launched Pixel 3 and Pixel 3 XL smartphones in addition to the Pixel Slate tablet during the event organized on Tuesday in New Delhi and New York. The main thing is that the tablet can be attached to the keyboard. Google's pixel slate is the first tablet that runs on the Chrome operating system. Google Pixel Slate comes with 10-hour battery life, dual front speakers, touchscreen smart display and pixel state pen support. In addition to the Chrome OS, Google Play Store will be able to easily download the Android app in Google pixel slate. The starting price of Pixel Slate is $ 599 (about Rs 44,400). Customers will be able to buy the tablet in Midnight Blue color. Customers who purchase pixel slate tabs will also be offered a free YouTube TV subscription for three months from Google. 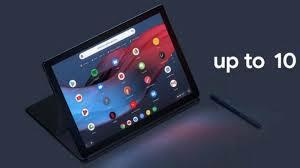 The Google Pixel Slate keyboard price is $ 199 (about 14,700 rupees), Google pixel state pen costs $ 99 (approximately $ 7,300). Pixel Slate will be available for sale on Google Store and other partnering outlets in the US, UK, and Canada by the end of this year. In the tab, you will get pre-installed Adobe Acrobat. Pixel Slate has a 12.3-inch (2,000x3,000 pixels) LTPS LCD display. The tab will come with 8th generation Intel Core M3, Core i5, i7 and 4-GB / 8GB / 16GB RAM with the Siller on a processor. To save photos, videos and other things, 32GB / 64GB / 128GB or 256 GB inbuilt storage will be available. Now talk camera setup. For photography, it will have an 8 megapixel rear and selfie camera. The tablet has a 48Whr battery, which claims 10 hours of battery life once charging. Pixel Slate is equipped with fast charging support. Its length-width is 202.04x290.85x7.0 millimeters and its weight is 721 grams. Speaking of connectivity, it comes with two USB-C ports, WiFi 802.11 A / B / G / N / AC, pin to connect the keyboard, Bluetooth 4.2 support.